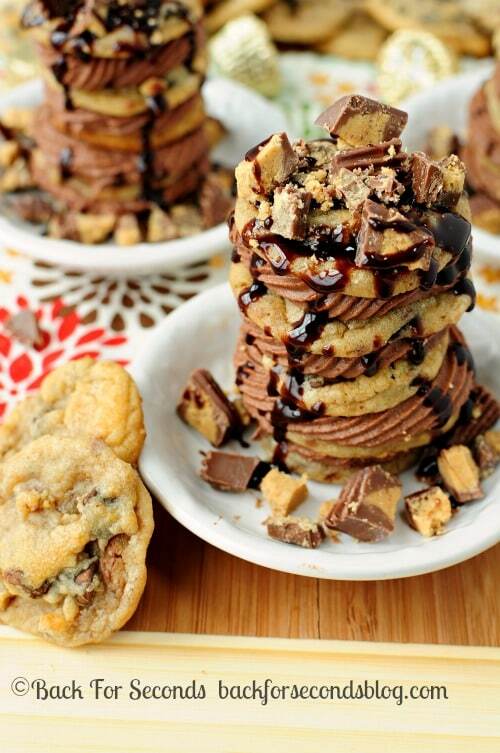 Take your cookies to a whole new level of amazing! 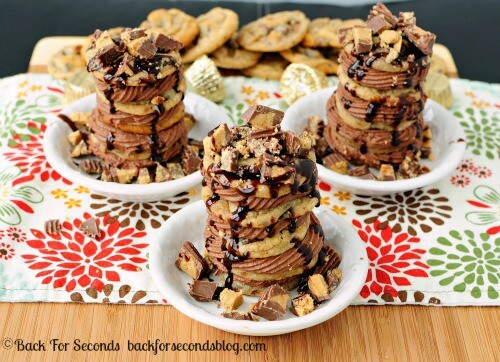 These Reese’s Overload Cookie Layer Cakes are outrageously delicious! You all are is serious luck today. You are getting two killer recipes for the price of one. These Reese’s Peanut Butter Cup Cookies are incredible on their own – seriously one of the best cookies I’ve ever eaten! They are soft and chewy, and completely addictive. When making the cookie dough, I toss the peanut butter cups in whole. When you gently turn on the mixer to stir them through the batter, they break apart in all different sizes. This makes for an awesome cookie. 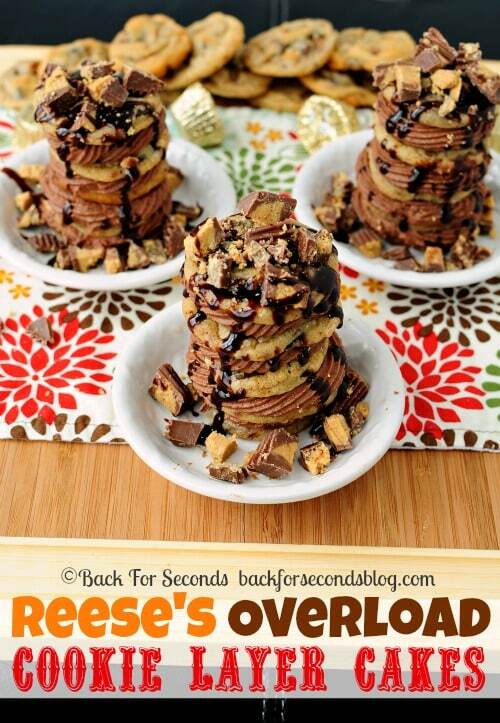 Some bites have big chunks of peanut butter, others are more loaded with chocolate. The peanut butter breaks up enough that you taste it in every bite, and I just love the texture of these cookies! Like I said, the cookies alone are stellar. You need to make them! Just to put these cookies over the top, I decided to make the cookie version of a layer cake. 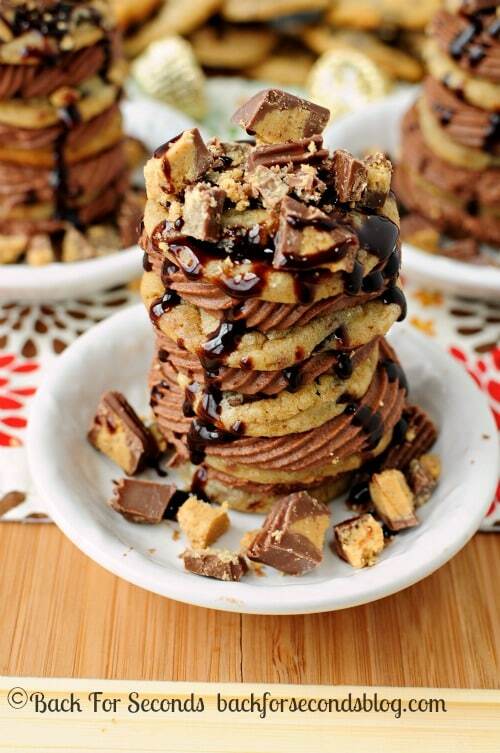 I stacked the cookies with my favorite chocolate fudgy frosting, then smothered them in even more peanut butter cups and a drizzle of chocolate. Seriously scrumptious!!! Have you entered the Albion Fit giveaway yet? Today is the last day to enter!